Savannah, GA | A couple of tourists from Canada made a surprising discovery while scuba diving in Wassaw Sound, a small bay located on the shores of Georgia. 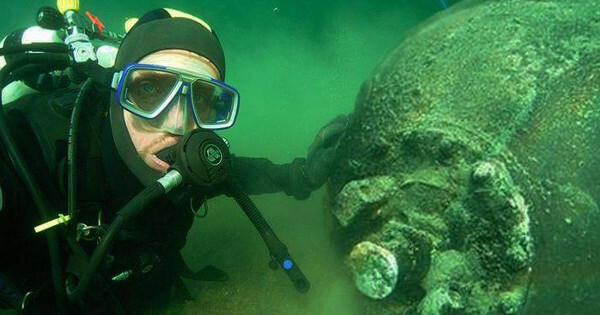 Jason Sutter and Christina Murray were admiring the marine life of the area when they stumbled upon a Mark 15 thermonuclear bomb that had been lost by the United States Air Force more than 50 years ago. The couple from London in Ontario, was on a two-week vacation in Georgia and Florida to practice their favorite hobby, scuba diving when they decided to dive near the shores of Tybee Island. While admiring the plants and fishes near the sea floor, they noticed a large cylindrical item partially covered by sand. They investigated the object and found out that it was actually a sort of bomb or missile, so they decided to contact the authorities. The couple is still shocked after their frightening discovery and say they will avoid diving for the rest of their trip. Rapidly understanding the gravity of the situation, the 911 operator contacted every possible emergency service, including the coast guard and the military, leading to the deployment of more than 20 ships and 1500 men in the area. Using the GPS coordinates given by the couple, they rapidly located the powerful 3.8 megaton bomb. An unmanned submarine was sent to determine the condition of the bomb before explosive experts were sent to disarm it. Fortunately, the thermonuclear weapon produced in 1955 seemed in sufficiently good shape for a team of Navy seals to try to defuse it. They successfully deactivated the warhead after hours of strenuous work, allowing the rest of the bomb to be moved. The delicate recovery operation took more than 48 hours, but the bomb was finally recovered and transported Mayport Naval Station in Florida. A full set of tests and analysis will now be performed on the warhead to evaluate its actual state and the possible ecological and health hazard that its presence in the bay for 50 years could represent. Navy explosive ordnance Disposal technicians spent nearly five hours working on the warhead before they were able to extract the detonator and the uranium core of the weapon, allowing the fuselage to be moved. The federal and state authorities were well-aware that a nuclear warhead had been lost in the area in the 1950’s and had never been recovered, but no efforts had been done for years to recover it. It was lost on the night of February 5, 1958, when a B-47 Stratojet bomber carrying the 7,600-pound hydrogen bomb on a simulated combat mission off the coast of Georgia collided with an F-86 Saberjet fighter at 36,000 feet of altitude. The collision destroyed the fighter and severely damaged a wing of the bomber, leaving one of its engines partially dislodged. The bomber’s pilot, Maj. Howard Richardson was instructed by the Homestead Air Force Base in Florida. to jettison the H-bomb before attempting a landing. Richardson dropped the bomb into the shallow waters of Wassaw Sound, near the mouth of the Savannah River, where he believed the bomb would be swiftly recovered. The crew did not see an explosion when the bomb struck the sea and they managed to land the B-47 safely at the nearest base. For the following six weeks, the Air Force looked for the bomb without success. Underwater divers scoured the depths, troops tromped through nearby salt marshes, and a blimp hovered over the area attempting to spot a hole or crater in the beach or swamp. Researches were finally abandoned and the bomb remained hidden for more than 50 years until the unlucky couple stumbled upon it. 1 Comment on "Georgia: Amateur Divers Find Long-Lost Nuclear Warhead"